Jacob Fernandes ’13 accepts the inaugural Joanne Marino-Murray Scholarship during Westbrook High School’s graduation ceremony in June 2013. In a move that advances its mission to support Westbrook’s young people in the formative stage of their lives following high school graduation—and in response to the skyrocketing costs of higher education—the Westbrook Foundation will award an unprecedented $146,000 in scholarships to members of the Class of 2018 this spring. The scholarships, which number nearly two dozen, will assist Westbrook residents of all socioeconomic backgrounds as they begin their post-secondary education at two- and four-year colleges, universities, and trade schools. Board members kept the intentions of Barbara Spencer, the Foundation’s founding benefactor, in the forefront of their minds when making this decision. “Barbara Spencer was a career educator who deeply valued higher education, and I know she would have been thrilled to support this effort,” said Foundation Co-Chair Brian O’Connor. 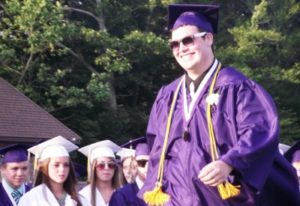 Several scholarships bear Spencer’s name, and they are among the many whose amounts have been substantially increased this year. “Westbrook is one of the smallest towns in the state, with one of the smallest public school systems. It is extraordinary that we are able to offer opportunities of this magnitude to our students, thanks especially to the vision and planning of Barbara Spencer in 1984,” said Lawrence Lariviere, chair of the Foundation’s Scholarship Committee. An-Ming Truxes, a member of the Scholarship Committee, said that the Barbara Spencer Scholarships will become prestigious awards for which Westbrook’s top students will compete each year—perhaps with their eye on the prizes as early as middle school. © 2019 The Westbrook Foundation.